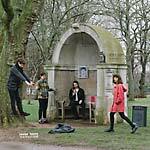 Upset The Rhythm present Deaths, the final part in a trilogy of albums by Sauna Youth that started with Dreamlands (WAAT 048LP/049CD) in 2012. Dreamlands was followed by Distractions (UTR 071CD/LP, 2014) and consequently the songs that comprise Deaths are collectively about the act of finishing, an ode to "the ending". Creating this album was a working research project embodying what is sometimes the hardest part of musical endeavor: completing a record. Making a new album is always daunting, but when all band members also have full-time jobs and other commitments it can also seem logistically impossible. Then there is the nagging, unattainable perfectionism that can draw out a record for months or even years. The twelve tracks on Deaths touch on political rhetoric, artistic legacy, action and passivity, work and leisure, and, of course, distraction, referencing many musical genres in the process while never leaving punk's orbit. The album was recorded by John Hannon of No Recording Studios in June 2017 over three days, mixed by Jonah Falco and mastered by Kris Lapke. The cover was shot in a garden in Brixton by Owen Richards, who also photographed the covers for the previous albums. Additional artwork was provided by R.M. Phoenix. Sauna Youth is Boon, Mince, Ecke, and Pines. They played together in the band Monotony, and between them have played or do play in other bands and music projects including Primitive Parts, Feature, Child's Pose, Lilac, Cold Pumas, Oblate, Teufelskreis, Mind Jail, Gold Foil, and Tense Men as well as being involved with the organizations Good Night Out, The Positive Press, Constant Flux, and Heart n Soul. 180 gram, limited color vinyl; Includes poster; Edition of 500. 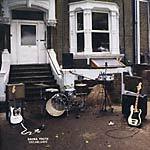 Upset The Rhythm present Deaths, the final part in a trilogy of albums by Sauna Youth that started with Dreamlands (WAAT 048LP/049CD) in 2012. Dreamlands was followed by Distractions (UTR 071CD/LP, 2014) and consequently the songs that comprise Deaths are collectively about the act of finishing, an ode to "the ending". Creating this album was a working research project embodying what is sometimes the hardest part of musical endeavor: completing a record. Making a new album is always daunting, but when all band members also have full-time jobs and other commitments it can also seem logistically impossible. Then there is the nagging, unattainable perfectionism that can draw out a record for months or even years. The twelve tracks on Deaths touch on political rhetoric, artistic legacy, action and passivity, work and leisure, and, of course, distraction, referencing many musical genres in the process while never leaving punk's orbit. 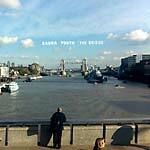 The album was recorded by John Hannon of No Recording Studios in June 2017 over three days, mixed by Jonah Falco and mastered by Kris Lapke. The cover was shot in a garden in Brixton by Owen Richards, who also photographed the covers for the previous albums. Additional artwork was provided by R.M. Phoenix. Sauna Youth is Boon, Mince, Ecke, and Pines. They played together in the band Monotony, and between them have played or do play in other bands and music projects including Primitive Parts, Feature, Child's Pose, Lilac, Cold Pumas, Oblate, Teufelskreis, Mind Jail, Gold Foil, and Tense Men as well as being involved with the organizations Good Night Out, The Positive Press, Constant Flux, and Heart n Soul. Sauna Youth is an evolving band of young future humans making truly irregular punk not quite comparable to anything else. Sauna Youth's debut long-player, Dreamlands was a joint release between Gringo Records and Faux Discx. This is its first time on CD. Sauna Youth, attracted to the possibilities apparent within a DIY philosophy, have been self-recording and self-releasing their own music since 2010, creating a number of split 7"s and cassettes. "Weird" is a meaningless platitude, and "art punk" is a classifier that shouldn't be required. Sauna Youth journey into the far-reaching wilds of the unfolding psyche and feast on the chaos within, quickly collapsing any pre-conceived notions within minutes of impolite introduction. As Kurt Cobain once asked "Why can't we be both Black Sabbath and The Beatles? ", Sauna Youth consistently and urgently pose the question, "Why can't we be both The Ramones and Steve Reich?" 180-gram reissue of Sauna Youth's 2012 debut LP, Dreamlands, following their well-received 2015 album Distractions (UTR 071CD/LP). Sauna Youth, attracted to the possibilities apparent within a DIY philosophy, have been self-recording and self-releasing their own music since 2010, creating a number of split 7"s and cassettes. "Weird" is a meaningless platitude, and "art punk" is a classifier that shouldn't be required. 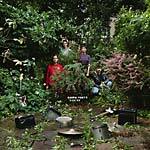 Sauna Youth journey into the far-reaching wilds of the unfolding psyche and feast on the chaos within, quickly collapsing any pre-conceived notions within minutes of impolite introduction. Clear 7". Limited edition of 500. Irregular punk band Sauna Youth follow their lauded 2015 Distractions album (UTR 071CD/LP) and an appearance on Marc Riley's All Shook Up BBC Music TV show with a 7" containing "The Bridge" (from Distractions) and exclusive track "Blurry Images." Beginning and ending in squalling feedback, "The Bridge" is the song that rings longest in the listener's head when listening to Distractions; brisk, tireless, and smart as a whip. "Blurry Images" pins its drumbeat and bassline down with throbbing keyboard jabs before one of the most unhinged guitar solos the band has yet committed to tape. Consisting of Richard "Boon" Phoenix (drums, vocals), Lindsay Corstorphine (guitar), Jen "Ecke" Calleja (vocals, sampler), and Christopher Murphy (bass), Sauna Youth are a punk band that's happy to embrace all of the contradictions that go along with that notion. They are at times furious, unstoppable, and severe, with the sampler wailing like an alarm coming from a parallel universe; then chugging, poppy, harmonious, and fun. Forever loud. As Kurt Cobain once asked, "Why can't we be both Black Sabbath and The Beatles?" Sauna Youth consistently pose the question, "Why can't we be both the Ramones and Steve Reich?" They recorded Distractions over a couple of days in July 2014 at Sound Savers in Homerton with Mark Jasper, mixed it themselves, and had it mastered by Kris Lapke. It's an album that feels instinctive and natural, flowing freely from a band that has come to terms with the sum of its parts. Ultimately, though, Sauna Youth have made a colossal record that is impossible not to dance to. "Transmitters" races off with its guitars pulsing and chopping before the chorus crashes in like a wave. Ecke and Boon sing in unison, creating a voice of no specific gender and allowing the songs to be sung from multiple perspectives and from a place of shared experience. On "Cosmos Seeker," the drums pin the jabbing guitar chords and vocals in place, surrounded by a propulsive swarm of sound. Distractions also includes two poems put to music: "(Taking a) Walk," by Ecke, is a rumination on the body, specifically female, in public spaces; "Paul," by Boon, explores individuality and authentic performance. In addition to performing as Sauna Youth, all four members, in swapped roles, also make up the band Monotony, which they formed while writing Distractions in 2014. Later in 2014, they did two sessions over two days as both bands for Marc Riley on BBC 6 Music, and performed as both bands at DRILL Festival: Brighton, after being invited by Wire. Members of Sauna Youth also play in Tense Men, Primitive Parts, Feature, and Cold Pumas. They've previously played with Pissed Jeans, Thee Oh Sees, Ty Segall, and Protomartyr; toured with Ceremony and Cold Pumas; and played at both the Liverpool International Festival of Psychedelia and Oslo Psych Fest. 180-gram LP version. Limited to 700. Consisting of Richard "Boon" Phoenix (drums, vocals), Lindsay Corstorphine (guitar), Jen "Ecke" Calleja (vocals, sampler), and Christopher Murphy (bass), Sauna Youth are a punk band that's happy to embrace all of the contradictions that go along with that notion. They are at times furious, unstoppable, and severe, with the sampler wailing like an alarm coming from a parallel universe; then chugging, poppy, harmonious, and fun. Forever loud. As Kurt Cobain once asked, "Why can't we be both Black Sabbath and The Beatles?" Sauna Youth consistently pose the question, "Why can't we be both the Ramones and Steve Reich?" They recorded Distractions over a couple of days in July 2014 at Sound Savers in Homerton with Mark Jasper, mixed it themselves, and had it mastered by Kris Lapke. It's an album that feels instinctive and natural, flowing freely from a band that has come to terms with the sum of its parts. Ultimately, though, Sauna Youth have made a colossal record that is impossible not to dance to. "Transmitters" races off with its guitars pulsing and chopping before the chorus crashes in like a wave. Ecke and Boon sing in unison, creating a voice of no specific gender and allowing the songs to be sung from multiple perspectives and from a place of shared experience. On "Cosmos Seeker," the drums pin the jabbing guitar chords and vocals in place, surrounded by a propulsive swarm of sound. Distractions also includes two poems put to music: "(Taking a) Walk," by Ecke, is a rumination on the body, specifically female, in public spaces; "Paul," by Boon, explores individuality and authentic performance. In addition to performing as Sauna Youth, all four members, in swapped roles, also make up the band Monotony, which they formed while writing Distractions in 2014. 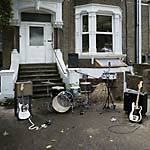 Later in 2014, they did two sessions over two days as both bands for Marc Riley on BBC 6 Music, and performed as both bands at DRILL Festival: Brighton, after being invited by Wire. Members of Sauna Youth also play in Tense Men, Primitive Parts, Feature, and Cold Pumas. They've previously played with Pissed Jeans, Thee Oh Sees, Ty Segall, and Protomartyr; toured with Ceremony and Cold Pumas; and played at both the Liverpool International Festival of Psychedelia and Oslo Psych Fest.